My round robin group decided to do a five sided center round robin. 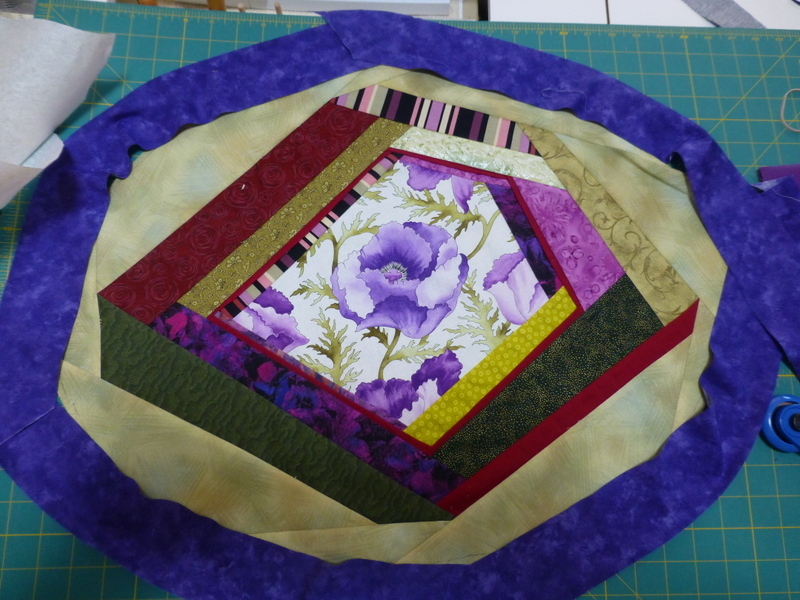 I am working on the last round and decide to first make the piece into an oval shape and then put on a narrow frame like border. I have added the pieces and cut the edges in to the oval shape. I cut the bias but now I am afraid to continue. I do not think the border will lie flat if all I do is sew the bias on. Any ideas? I don't know what you mean, a picture would help. Do you mean you are turning the 5 sided middle into an oval shape with frame? If you are worried about the frame not laying flat maybe you can add piping instead? The change from a pentagon to oval is confussing to me. I'd understand a circle. I also think a picture would help. If you applique the pentagon to the retangular fabric, then cut out the oval, I think you could get the grain going horizontal and verticle. Are you then planing to put the oval into a frame to make it retangular? I guess I don't understand why you'd change the shape of the pentagon (5 sided) if that's what the group decided to make originally? Maybe you're stuck because it "no longer works"??? Here is a picture. I wanted to finish the piece and thought Oval would be a nice shape. Sorry this reply took so long. We were out of town. My camera changed the purple of the frame to Blue.